I hope everyone has a great holiday and eats too much, has a nap, has a second dinner, eats some dessert, has a few drinks, has another nap, gets some presents and maybe has a bit more pie. Well you get the picture. 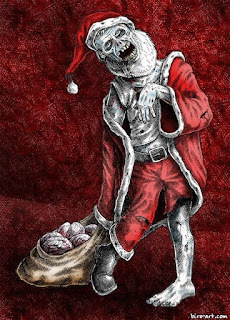 Get off the internet and spend some time with your family and friends... and if you can, have a game or two, I hear zombie Santa is on the loose and we need some brave adventurers to stop him. I am gearing up for a new campaign and in the process of finishing all the fun bits and pieces. This is my favorite time, just before the show starts and the lights come on. I am trying very hard to create a campaign that will execute maximum awesome with minimum stress. 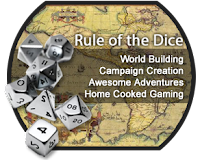 I try to follow three simple rules when I create a new campaign and get ready to throw my players into it. 1) Your players are your campaign - Make the campaign for your players, not for you. Its that simple. 2) Create stories, not a story - Its always a temptation to go all Lord of the Rings with a campaign. DON"T.... you are not Tolkien and this isn't Middle Earth. Creating an epic over-arching super story that binds the characters into an amazing epic adventure is almost always doomed to fail. Create many stories for your world and let your players own ambitions create the epic story.